Last week we heard that Owen Paterson, the UK’s environment minister, is claiming that GM crops are necessary to help address hunger in developing countries, and that it would be immoral for Britain not to help developing countries to take up GM. Millions of small-scale farmers inAfrica would disagree. African farmers and civil society have repeatedly rejected GM crops, and asked their governments to ban them. Paterson does not appear to understand the complex realities and challenges of farming in Africa. Nor does he seem to grasp the limitations of GM crops. He fails to recognise that farmers in Africa already have effective approaches to seed and agriculture, which are far more environmentally and farmer-friendly than GM. Most of all, he fails to acknowledge the devastating impact that GM crops will have on African farmers and farming systems. In the UK, Africa is often talked about as a failing continent where the hungry apparently wait around for northern benefactors to save us. Talk of Africa seems to imply that we have little or no food production, that our farmers are clueless, our seed unproductive. We won’t go into how patronising and insulting this attitude is. Instead, we will focus on how this failure to acknowledge African farming systems and seed is being used to wipe them out. Traditional African farming systems have developed an incredible diversity of seed varieties, which are able to deal with the multiple challenges of farming. Seed breeding is a complex art, and scientists who really listen and engage will realise that African farmers have a vast amount of ecological knowledge. 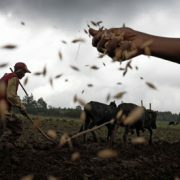 Having many different types of seed – bred for their flavours and better nutrition, and which have evolved with local pests and diseases and are adapted to different soils and weather patterns – is a far better strategy of resilience than developing a single crop that is bound to fail in the face of climate change. It is a myth that the green revolution has helped poor farmers. By pushing just a few varieties of seed that need fertilisers and pesticides, agribusiness has eroded our indigenous crop diversity. It is not a solution to hunger and malnutrition, but a cause. 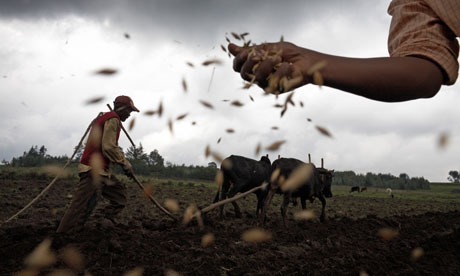 If northern governments genuinely wish to help African agriculture, they should support the revival of seed-saving practices, to ensure that there is diversity in farmers’ hands. But GM crops pose an even greater threat to Africa’s greatest wealth. GM companies make it illegal to save seed. We have seen that farmers in North America whose crop was cross-pollinated by GM pollen have been sued by the GM company. About 80% of African small-scale farmers save their seed. How are they supposed to protect the varieties they have developed, crossed and shared over generations from GM contamination? This will be a disaster for them. Paterson refers to the use of GM cotton in India. But he fails to mention that GM cotton has been widely blamed for an epidemic of suicides among Indian farmers, plunged into debt from high seed and pesticide costs, and failing crops. Paterson also refers to the supposed potential of GM crops developed to be drought-tolerant. These crops are not yet on the market, and we don’t know if they ever will be. The only two varieties of GM that have been sold in the past 15 years are resistant to a particular type of pest and a particular type of herbicide. Ask farmers if stalk borers or weeds are a cause of hunger in Africa, and they will laugh at you. Instead of waiting for expensive GM solutions that may never arrive – and will ruin us if they do – we have worked with communities who were able to produce surplus food in times of drought by returning to their traditional varieties. A long-term study (pdf) in Ethiopia showed that crops fare much better in an environment where soil and water is conserved in composted land than on land that is pumped full of fertiliser and imported seeds. Communities increasingly understand that modern seeds often fail in these times of changing climates and unpredictable weather. The only way to ensure real food security is to support farmers to revive their seed diversity and healthy soil ecology.